Chart topping Australian singer/songwriter Guy Sebastian is using Robe moving lights on his 47-date ‘Get Along’ Australian tour, the latest stage in his impressive career, which has been nothing less than supersonic since winning the first Australian Idol back in 2003. The tour’s lighting and visuals design has been created by Bruce Ramus, and lighting director / operator on the road is Simon ‘Junior’ Johnson. The lighting and video equipment is being provided by Melbourne based Powa Productions. Ramus has worked with Sebastian for about two years. He was given an open brief to come up with a flexible and dynamic scheme to help make the show rock on this one, the start of the live campaign to promote Sebastian’s latest number one album ‘Armageddon’ which is already double platinum! 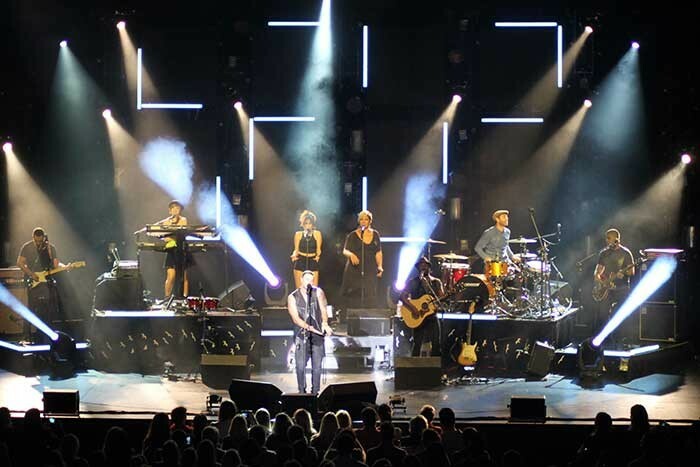 Ramus had used Robe moving lights on the last two of Sebastian’s tours – which was his first encounter with Robe products. He particularly liked the LEDWash 600, so decided to spec these again. In total, the rig contains 20 Robe LEDWash 600s together with nine ColorSpot 700E ATs and nine ROBIN MMX Spots. The LEDWash 600s are the core fixtures of the show providing base wash looks. Six are positioned on the floor either side of stage, used for side washes, with 14 rigged on two different levels across the back wall, poking through the gaps between the video screens. (Ramus’s studio also created all the video content). This positioning of the lights has enabled him to create some funky, integrated, organic looks combining the video content and the LEDWashes. The ColorSpot700E ATs are all on the front truss, used for front and key light on the band, while the MMXs are positioned on the floor and used as rear specials on the band and for low level beam effects. The different beam shapes available on the LEDWash 600s are "really useful" comments Ramus, adding: "They are bright and have a good range of pastels as well as saturates". 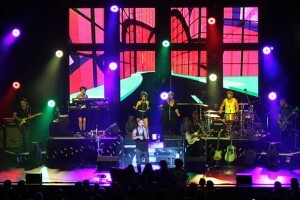 Junior has worked with Robe LEDWashes on previous Guy Sebastian tours and also used them on Jimmy Barnes tour. He comments on their great reliability. "All the fixtures have behaved perfectly during our intensive touring schedule. I use them for wash effects and also for eye-candy looks, which in combination with the mesh screens gives endless creative possibilities." The main challenge has been dealing with the different sizes and eclectic nature of the venues which have varied greatly. They are playing all the capital cities and numerous regional centres over the tour’s 14-week duration, for which the design has proved itself to be flexible and adaptable, able to scale up or down to suite the space.